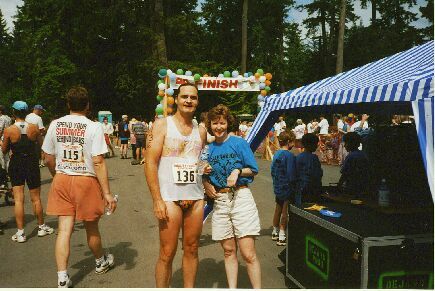 The old guy finishes fourth overall at the Qualicum Beach Triathlon, 1997. March 20 Comox Valley 8km Run. 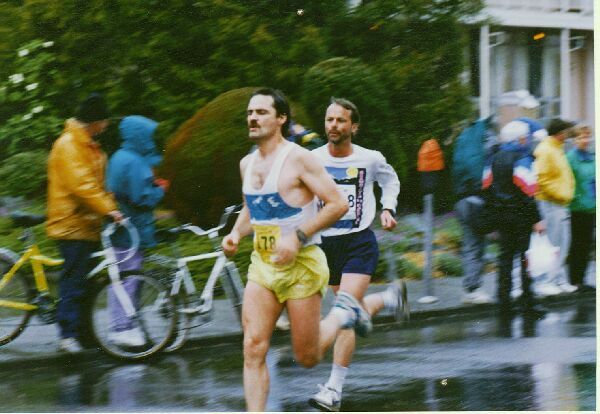 April 3 University of Victoria 5km Run. May 1 Ym/wca Tri-Clinic Triathlon: S500m, B15km, R6km. Victoria, BC. My first triathlon. June 5 Comox Valley Biathlon: Run 10km, Bike 40km. Courtenay, BC. My first duathlon. June 12 Ye Olde Victoria Triathlon (now know as the Panorama Classic Triathlon): S500m, B30km, R8km. Central Saanich, BC. June 19 Hilltopper Run (8.85km, mostly up!) Brentwood, BC. Nov. 26 Gunner Shaw Cross Country (9.5km) Thetis Lake, BC. May 14 Victoria cy-ru-thon R5km, B30km, R5km. June 4 Ye Olde Victoria Triathlon: S500m, B30km, R8km. June 24 Peace Arch Triathlon: S800m, B23km R8km. Bellingham, Washington State. August 13 Vancouver International Triathlon (VIT) S1500m B38km R11km. My finishing time=2:37:25. 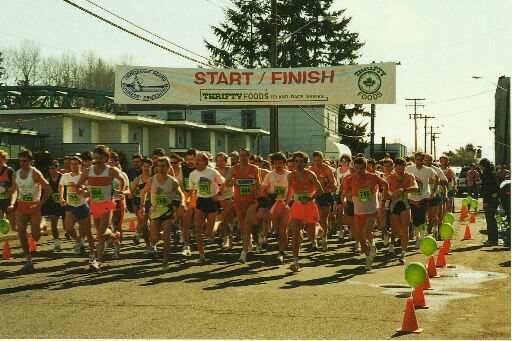 September 10 Derby Days Run 10km Port Angeles, Washington State. September 24 Royal Canadian Navy 10km Esquimalt, BC. October 8 Royal Victoria 8Km Finishing time=33mins. End of my second season. The 1989 season saw alot of racing. I don't recommend racing that much unless you are just participating and not caring where you place or your race time. This was my second year in multisports and I was very enthusiastic. I looked for every race I could find as well as going to different towns and cities to race. June 10 BC Telephone Duathlon Series Victoria, R5km, B30km, R5km. (1:27:22) 4th in age/group. June 16 Tsawwassen Triathlon: S800m, B20km, R7km. Tsawwassen, BC (1:21:00) 3rd premasters. June 23 Peace Arch Triathlon: S800m, B23km, R8km. Bellingham, Washington (flat tire, still finished). August 26 Ironman Canada Triathlon: S2.4miles B112miles R26.2miles (13:55:56) My first Ironman Race. Fair swim, good bike, fell apart on the run. October 20 Victoria Wellness Run (30:23) Some doubt as to the actual distance of this run. George Sheehan ran and was guest speaker. I finished 13th overall and first im my age group (35-39) but only 156 runners were in the race. October 28 Shawnigan Lake half-marathon. (1:26:02=pr) Consistant training, especially in running is paying off with fast times. Phil, Cory and Glen (me), 2nd team overall at Salmon Arm Triathlon 1991. February 17 Cedar 15km (1:00:08) Ran the race while I had a cold, nothing stops me. May 26 Prestige Duathlon Series#2 R5km, B35km, R5km (1:49:11)Whistler, BC Steve King announcing and David Rudd, all star masters duathlete. June 23 Salt Spring Triathlon: S1500m, B32km, R10km (2:20:40) A personal disaster! Know the course and drive or ride the bike route before the race. June 30 Twilight Shuffle 6.4km run Chemainus, BC (23:43) Do not go out too fast in a race unless you know what you are doing. I led this race for the first 30 seconds then slowly got swallowed up by the pack. July 27 Teleglobe Canada/English Bay World Cup Triathlon. Team entered: Cory, Swim 1500m (20:10), Glen, Bike 40km (1:06:26), Phil, Run 11km (32:29) = 1:59:05.3rd team overall. Greg Welch was the mens winner, Sue Schlatter (Hamilton, Ont.) won the womens race. August 4 Sri Chinmoy Tri/Duathlon: R6km B33km R10km (2:13:00)10th place finish overall. August 11 Salmon Arm Classic Triathlon. Team entered: Cory, Swim 1500m (21:14), Phil, Run 10km (32:07), Glen, Bike 40km (1:04:44)=1:58:59 Second in the team category. June 20 Peace Arch Triathlon: S.4miles, B14.5miles R5.2miles (1:39:19) Bellingham, Washington. 1992 was the 'burnt out year' in which I rested from the previous three years of running and triathlon. I needed the rest. January 24 Cedar 15km (59:22=pr) Finally under one hour on this course. Ended up 8th in the 35-39 Age Group for the Series. May 1 Elk/Beaver Lake Ultra Run 50km Completed 40km but just couldn't finish the run. Constant rain made the trails muddy and I just ran out of gas. (4:04:00) Perhaps I'll finish one of these yet. May 23-24 Island Farms Vancouver Island Relay. Sooke Team (mixed) I ran stage 8, 12.4km (55:01) hilly route on the first day. The second day I ran 9.6km killer mountain route. My first team race. Enjoyable. July 18 Volunteered at the Great Sooke Foot Race. The third time I've volunteered at a race, something I will do more often. Volunteers are indispensable, especially when they are trained properly. Another slow season has passed. Tried to change things by doing different races and distances. It can get boring doing the same races year in and year out.